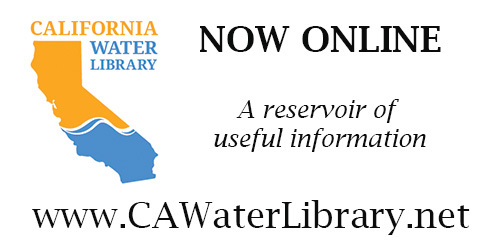 Dr. Andy Fisher is a professor at UC Santa Cruz and Director of UC Water, as well as the founder of the Recharge Initiative, a focused effort to protect, enhance, and improve the availability and reliability of groundwater resources. 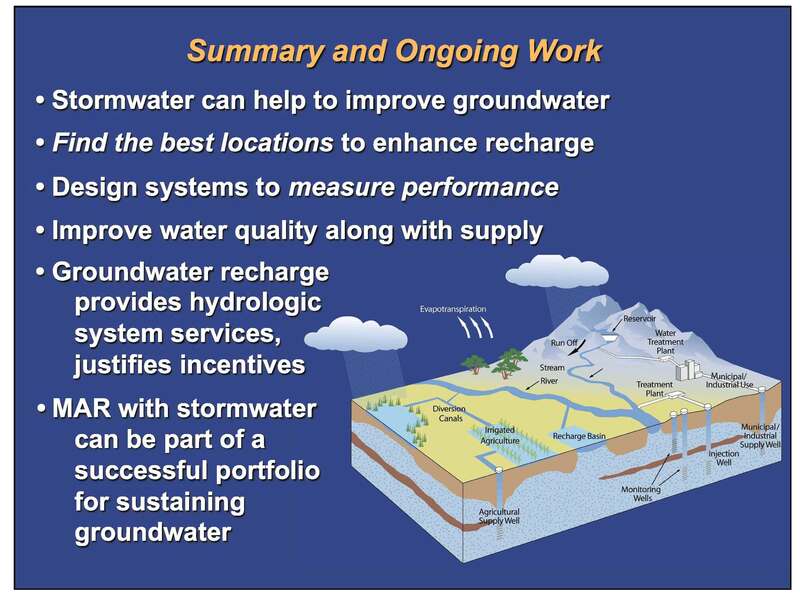 Dr. Fisher focuses on stormwater capture and recharge, including development of a metered recharge pilot project in the Pajaro Valley Water Management Agency where he looks at stormwater quality and at using GIS to map ideal locations for groundwater infiltration. 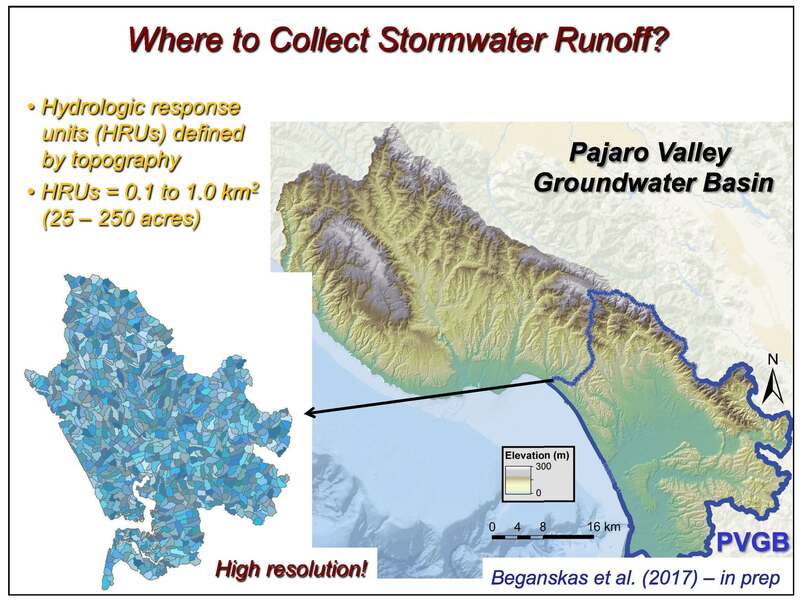 In this seminar presented by the State Water Board’s STORMS program, Dr. Fisher discussed the stormwater projects he’s been working on in the Pajaro Valley, stepping through the process of mapping, modeling, measuring, and then ultimately monetizing or incentivizing groundwater recharge. 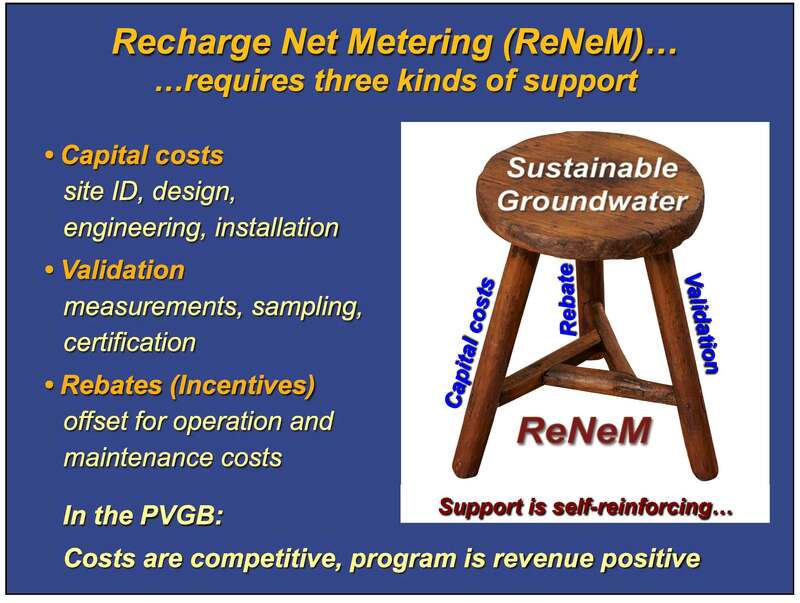 The Recharge Initiative has four components: mapping the locations where enhanced recharge might best be accomplished; modeling the availability of stormwater from hill slopes; design and create field projects and measure or validate the benefits to water supply and the improvements to water quality; and then monetize activities and policies that incentivize stakeholders and strengthen partnerships. 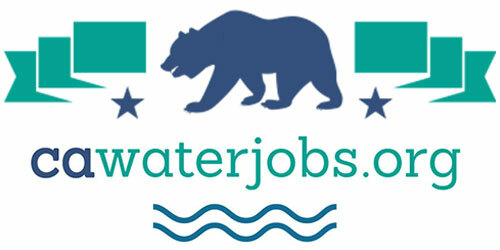 The area in which Dr. Fisher works at the northern end of Monterey Bay is located in California’s Central Coast hydrologic region, which is the region of the state that uses more groundwater to satisfy freshwater demand than any other part of the state. 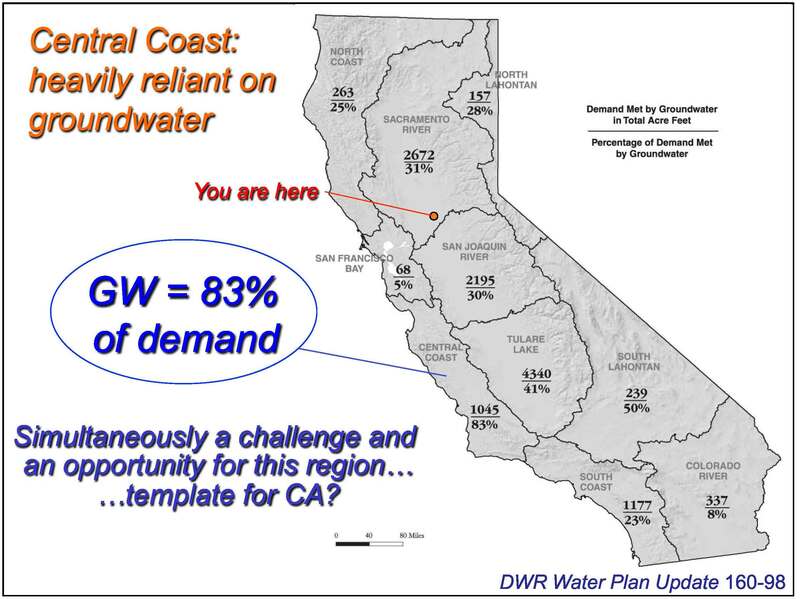 He presented a diagram from the California Water Plan, noting that the graphic shows water use; the number on the top is water use in thousands of acre-feet and the bottom is the percent that is satisfied by groundwater. 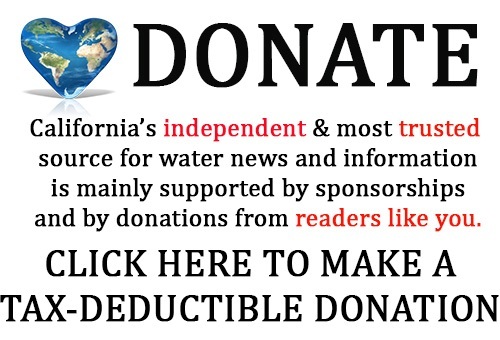 “Other parts of the state use more groundwater than the Central Coast, but they are at sort of a third or a quarter or half of the total supply. Central Coast region, it’s about 85%,” he said. The other challenge for the Central Coast region is that they are ‘off the grid’ in terms of water transfers; there is no imported water being delivered to the Central Coast area. “As a result, we really have to figure out a way to generate enough water to provide for needs in that region without thinking about bringing in water from elsewhere,” he said. 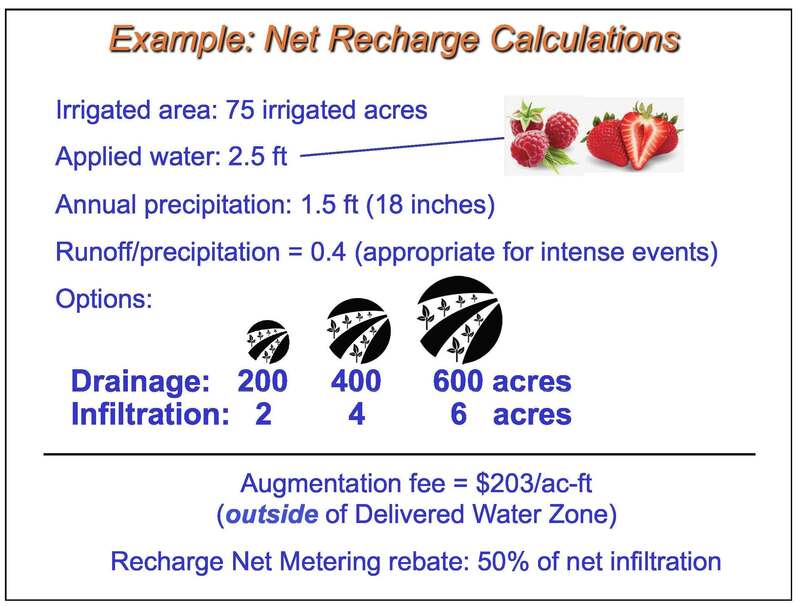 Dr. Fisher presented two forms of managed recharge: on the left, a picture of a feature of Low Impact Development in the form of a vegetated swale; these are often small scale systems that are set up very close to the source of runoff. The picture on the right shows the large scale spreading grounds for Orange County. 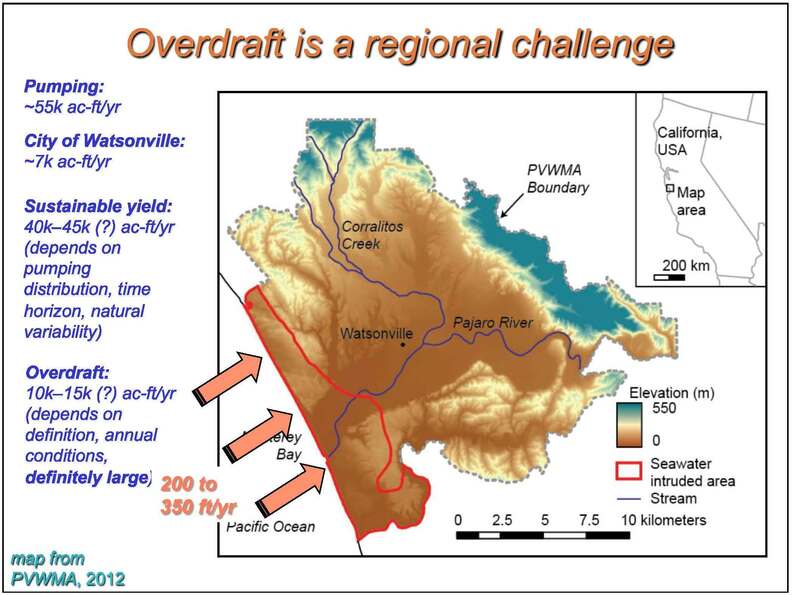 The Pajaro Valley Basin is shown in orange on the map; it’s located on California’s Central Coast on the northern side of Monterey Bay. 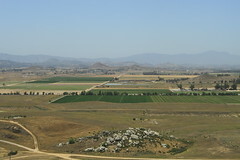 The Pajaro Valley basin is an agriculturally-developed basin that produces high value crops such as strawberries and cane berries. If the Pajaro Valley were a county, it’d be the smallest in California by far, but it would be number five in farm income, he noted. 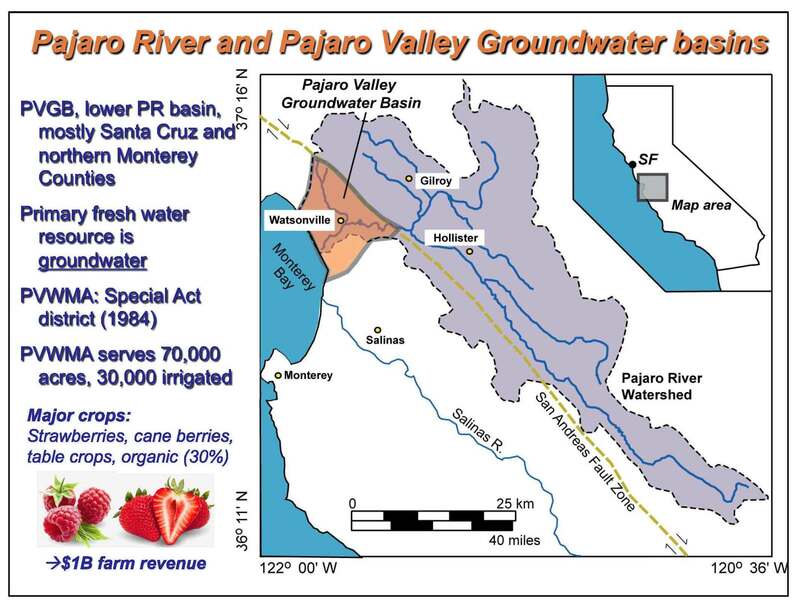 The Pajaro Valley Basin has no imported water, so virtually all of their water supply is groundwater. 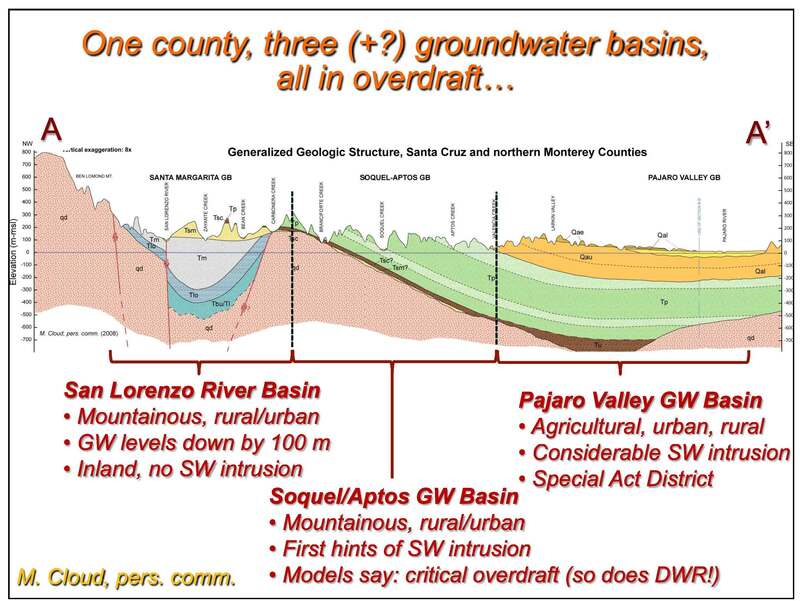 The Pajaro Valley Water Management Agency manages the groundwater; the agency is a special act district set up in the 1980s to address groundwater overdraft, which at that time was well understood to be on the order of tens of thousands of acre-feet per year. He then presented a slide with pictures showing the project when it was empty, and another showing the project when it is full. The project site was instrumented with a number of different tools, including a real-time monitoring system that allows data to be collected and viewed remotely; it also allows the landowner, the grower, or other stakeholders in the region to see what’s going on at the field site. 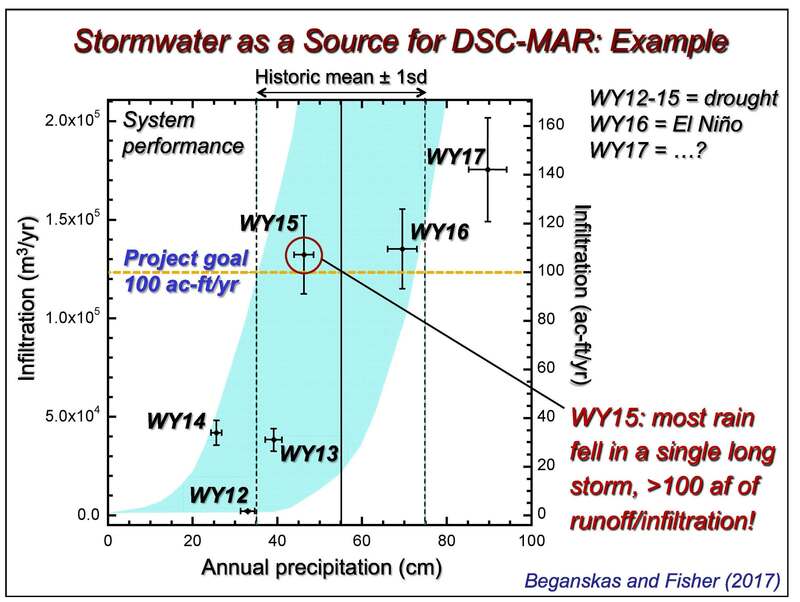 Dr. Fisher then presented data for three different water years. 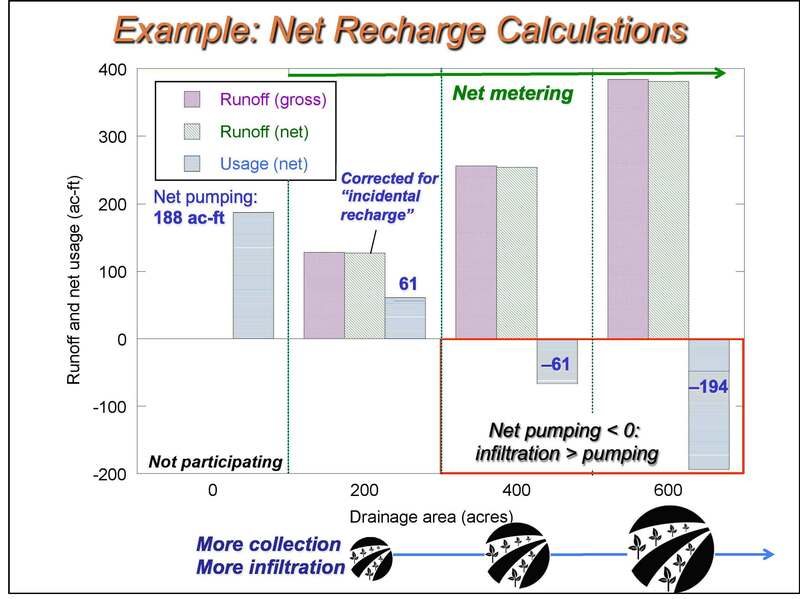 The graph shows the amount of infiltration, determined by calculating a mass balance on the basin. The infiltration in acre-feet is shown on the right hand side. The project goal was 100 acre-feet per year. The first three years of the project also happened to be the first three years of the drought, although things eventually did improve. 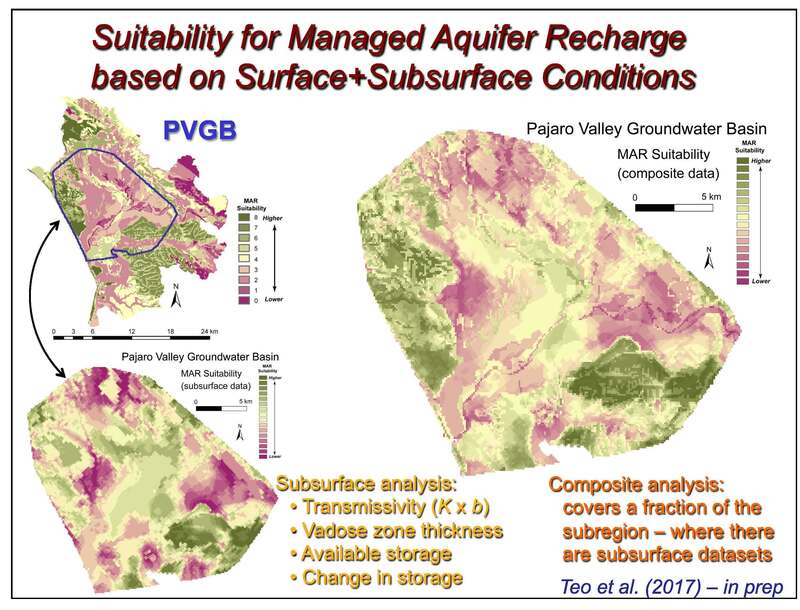 The next challenge was to figure out how to site similar projects across the landscape, given that the groundwater recharge conditions are highly variable from place to place, not only within the Pajaro Basin but around the state. 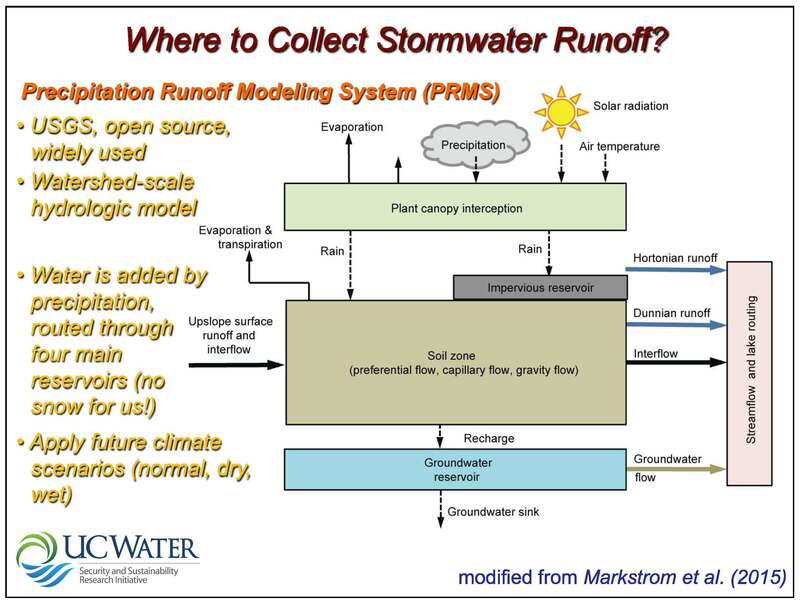 They undertook a project in collaboration with the Resource Conservation District of Santa Cruz County to identify sites for distributed stormwater collection could lead to managed aquifer recharge. The study region was all of Santa Cruz County, the northern part of Monterey County, and a little bit of San Benito. The general concept of the mapping work was to bring different data sets into a geographic information system or GIS, and then co-register them and overlay them to see where the different conditions correspond. 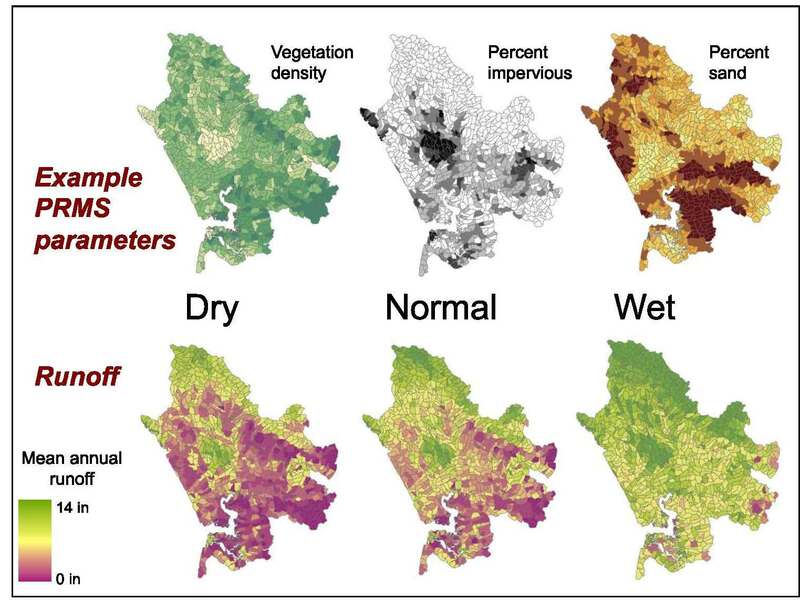 The concept is that if there are two maps of different soil properties, each with higher value areas and lower value areas, when the maps are laid on top of each other, the places where the high values overlap are the areas that are ideal. He then stepped through the process. 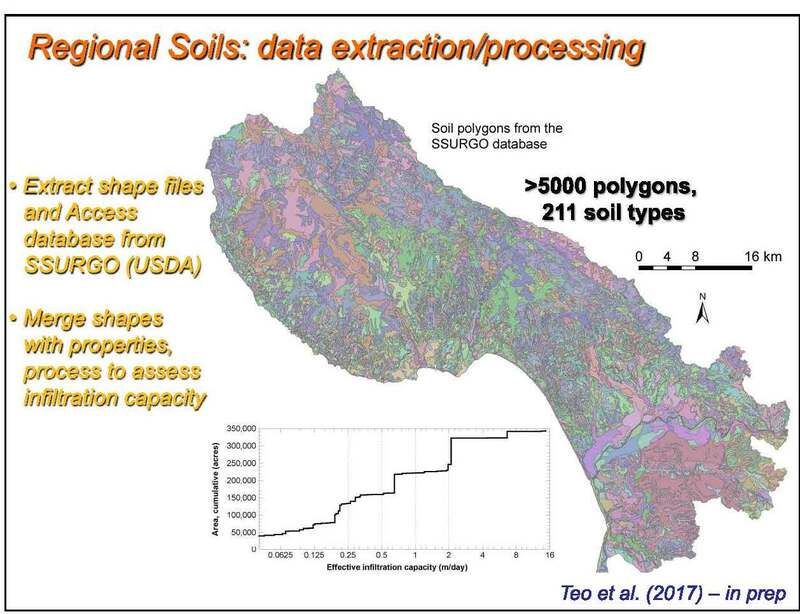 He presented a map from a soils database for the study region, noting that it includes more than 5000 little soil shaped polygons which have been mapped out by researchers, growers, the agricultural extension office, and the soil conservation service, and then put into a database that is publicly available. The infiltration capacity or the ease with which with which water will flow vertically through the soil is then calculated for each polygon. The calculated values ranged from essentially 0 up to 16 meters per day, so there is quite a range of soil properties. 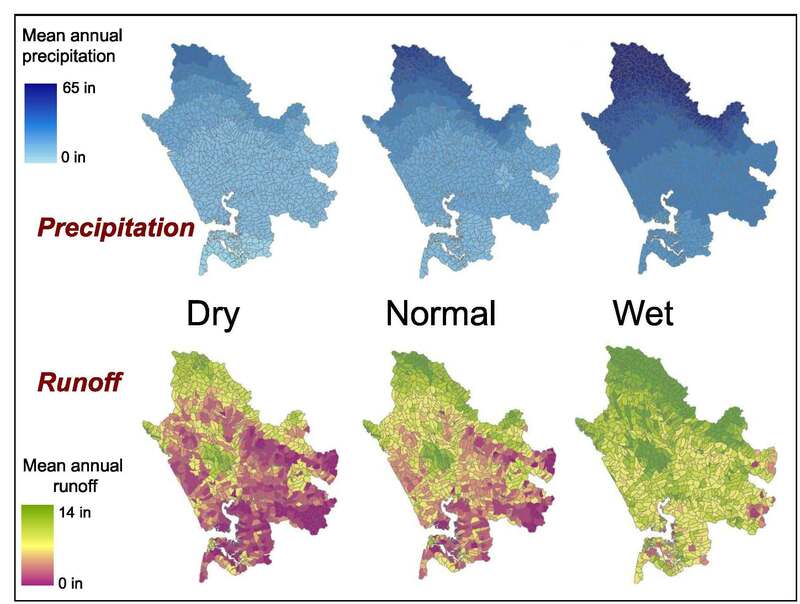 In the Pajaro Valley, the large areas in red tend to be floodplains or wetlands, areas with hydrophobic soils that water does not filtrate very easily, he said. That is then combined with the geological map, and areas that are aquifers are shown in green; pink signifies not an aquifer. 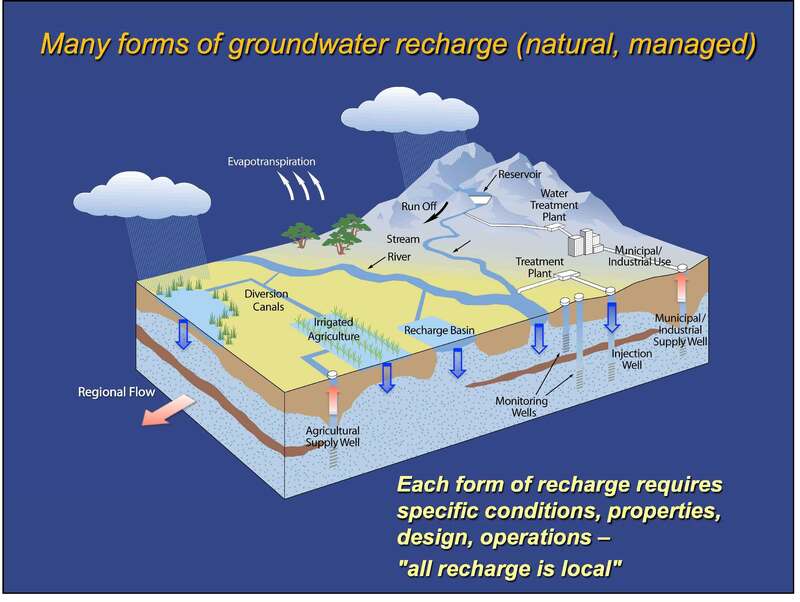 There are also areas in between where it may be in aquifer in some places but not in others. The light green represents secondary aquifers that aren’t heavily used in that particular part of the region. 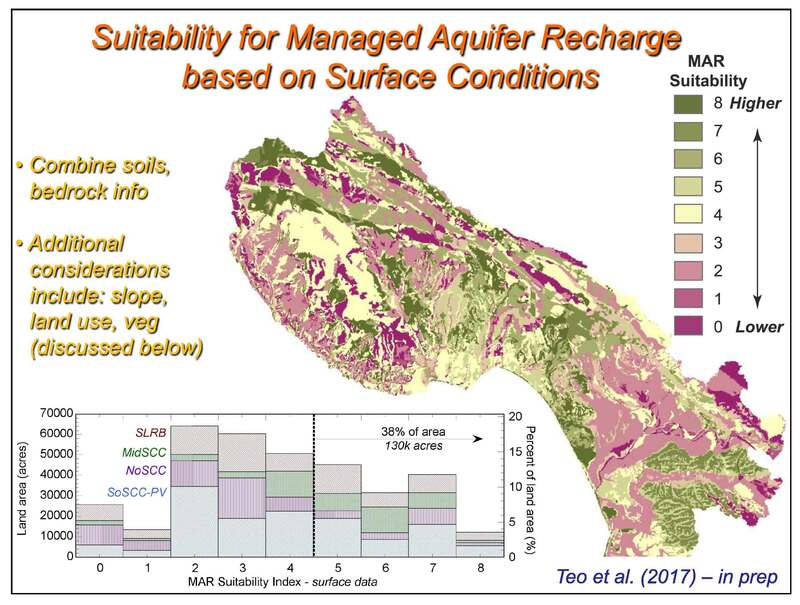 Those datasets are combined to make the initial surface map of managed aquifer recharge suitability. Areas that are in the greener colors are highly suitable, tans are moderately suitable, and then the pinks and reds have low suitability. Based on this initial map, about 40% of the area is moderately to highly suitable, based on these surface conditions. It does vary by basin; there’s actually four different groundwater basins in this study region, Dr. Fisher said. 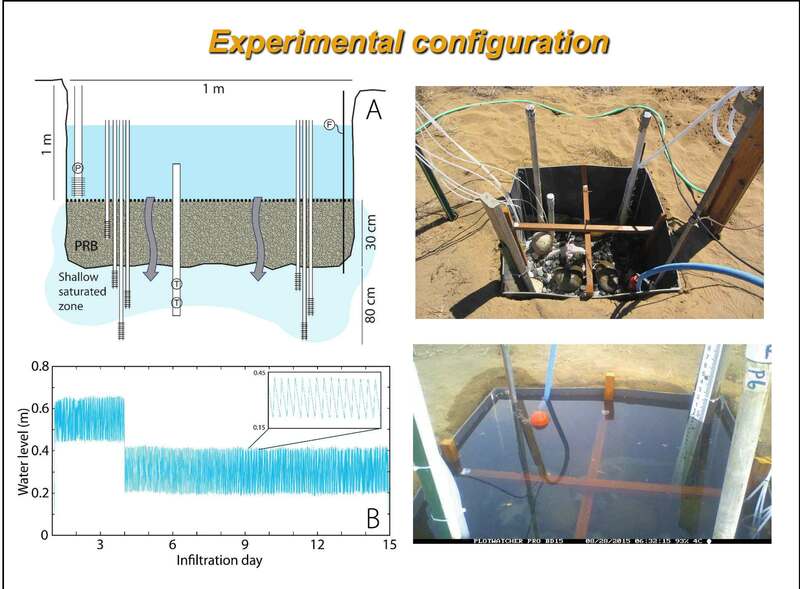 However, surface data is not quite enough; you need to look into subsurface as well, he said. He presented a cross-section of the study area from Santa Cruz County down into Monterey County. The subsurface data from groundwater models is then compiled, and other characteristics of the aquifers are assessed, such as the measure of the ease in which water can flow through the aquifers, the thickness, the ability of the aquifers to store water, and whether or not water levels have gone up or down with time. The four datasets are combined and a subsurface map is generated, showing higher suitability areas in green, lower suitable areas in orange. The result is a composite MAR suitability map, including six different data sets, the surface data plus the subsurface data. With the HRUs identified, they next need to be populated with more than 80 datasets for all the different properties, such as vegetation density, the percent of the shallow soil that’s made of sand, the percent impervious area, the presence of concrete or roads or other structures. 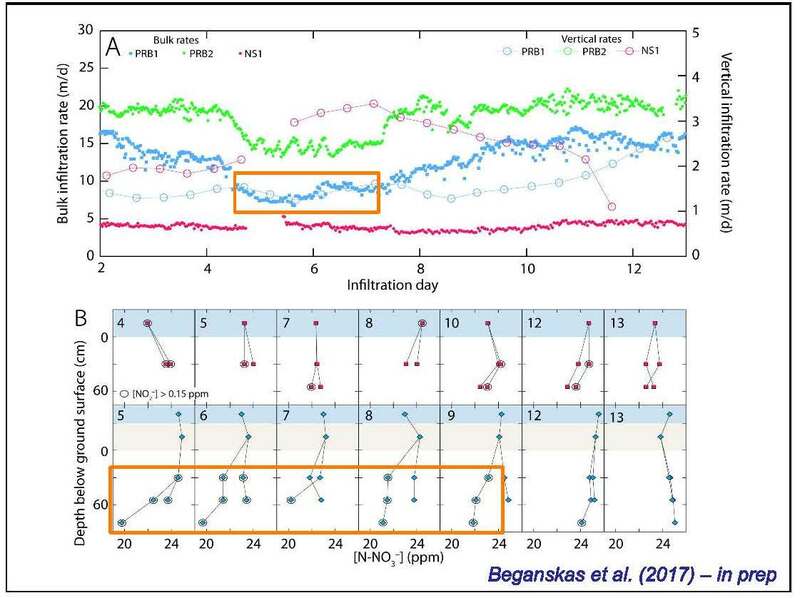 He presented some slides from the climate modeling (above) showing a dry simulation, a normal simulation, and a wet simulation. “All the years, even the dry years, have the occasional months with significant rainfall, just like we saw at our field site,” he said. He also noted that during the normal and the wet years, there’s a lot more persistence in the runoff. 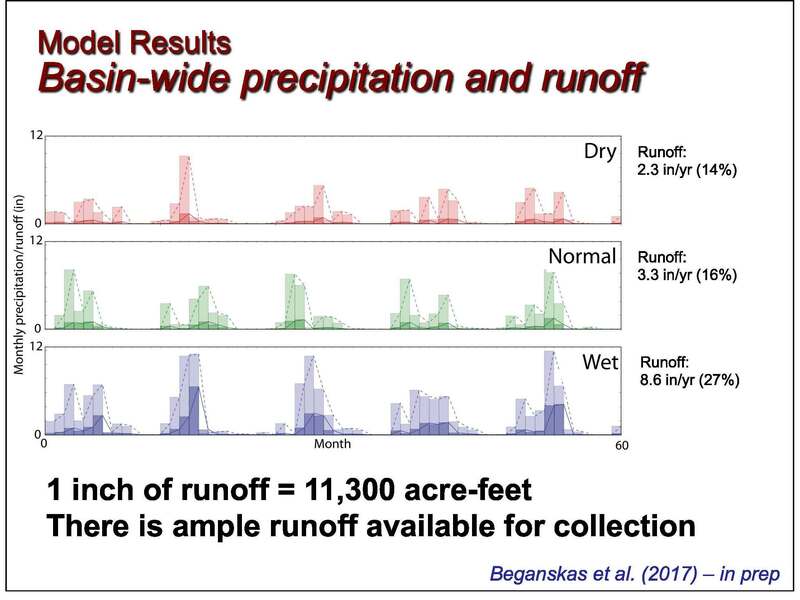 “That is, you’re much more likely to get a wet month after a wet month after a wet month, and that really compounds the effects of stormwater generation and opportunities to infiltrate groundwater,” he said. 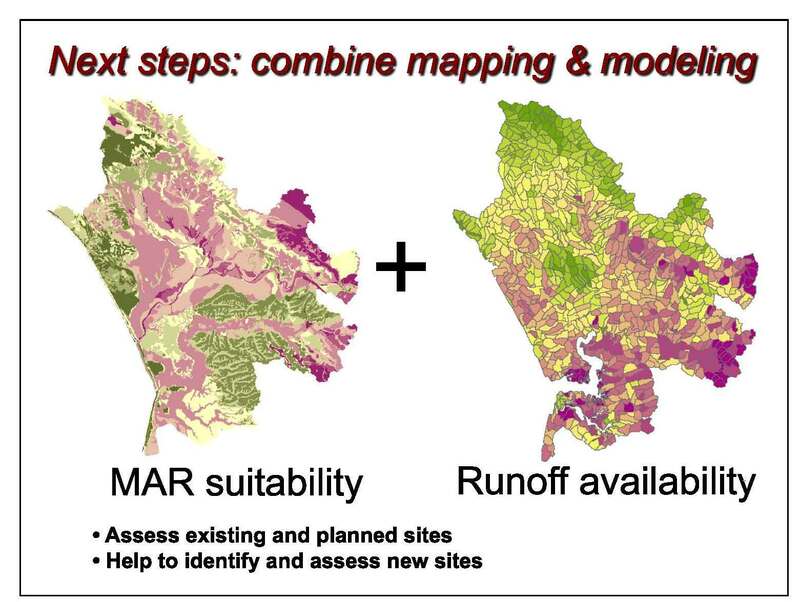 The next step is to combine the managed aquifer suitability map with the runoff map. “That’s what we’re in the process of doing, along with regional partners, the counties, municipalities, and local water agencies,” he said. At the present time, they are working on two groundwater recharge projects that are currently active; there are three more in development that are to be constructed this year. Dr. Fisher presented a slide of one of the new projects being constructed on a working ranch. The area being drained is over 1300 acres; the landowner has allocated about 15 acres in this parcel, seven of which will be used for a sediment collection system and then an infiltration system as well. This project was proposed by Dr. Fisher’s group, the Resource Conservation District, and the Pajaro Valley Water Agency and it was just approved a couple of weeks ago by the Coastal Conservancy. He acknowledged it’s quite a process to identify sites, do field studies with drilling to determine if conditions are right, and securing the cooperation of the landowner. There are often questions and concerns about the water quality of the stormwater that is infiltrating into the aquifer. 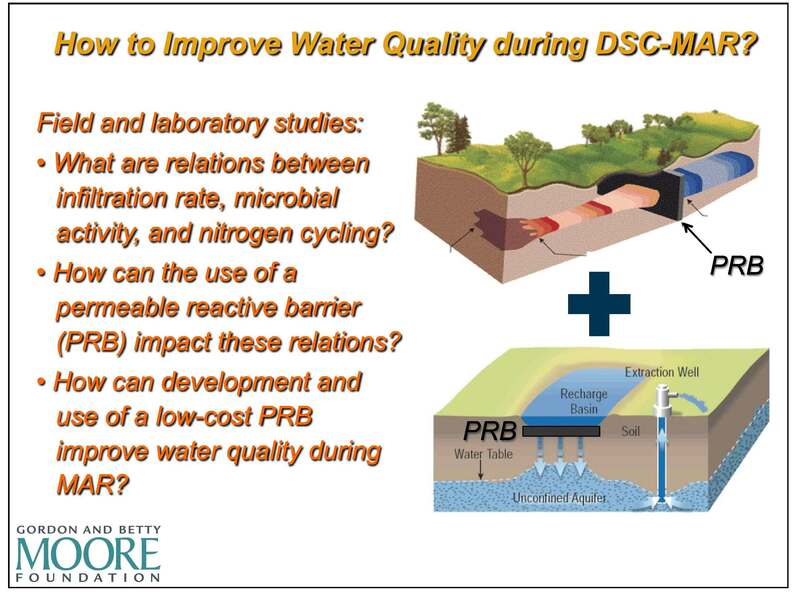 Dr. Fisher said that at another site they had studied about 10 years ago, they found a significant load reduction simply with water percolating through shallow soil if the conditions are right. “Our idea was to turn this on its side and to put a PRB as part of a recharge basin and see whether we could get some kind of water quality improvement, as well as what the operational effort be, and especially once we scale up, how hard is it going to be put one of these in and maintain it, if indeed it’s worthwhile,” he said. They ran infiltration tests for 2 weeks to mimic the conditions that would occur during the rainy season when one of these systems would get wet and stay wet for a while. They have also begun microbial studies to find out which bugs that live in the soil are actually responsible and whether they’re being changed in their populations because of the use of the PRB, he said. 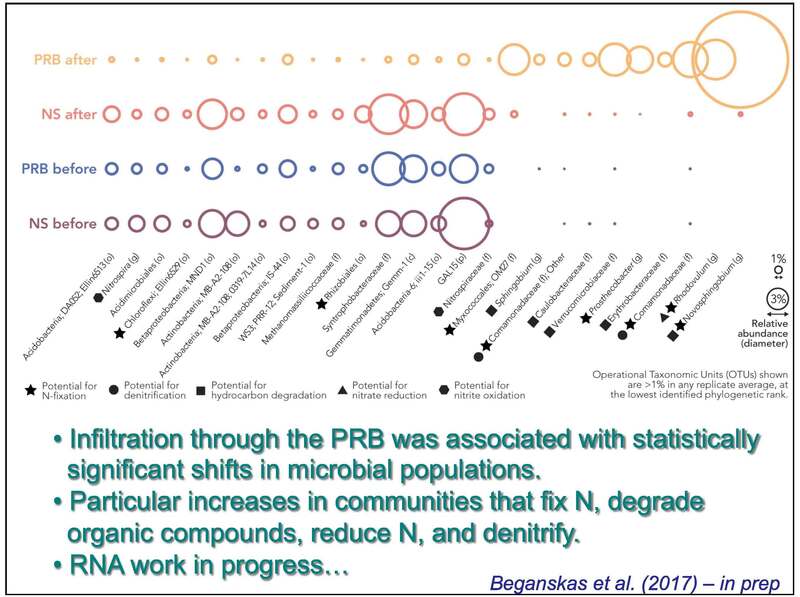 He presented a slide of some of the preliminary data, noting that the different groups of bacteria are listed along the bottom of the graphic; those with stars indicate nitrate fixers and the circles are denitrifiers. ‘NS’ stands for Native Soil; the size of the circle indicates the fraction of the microbes in the soil who are present. 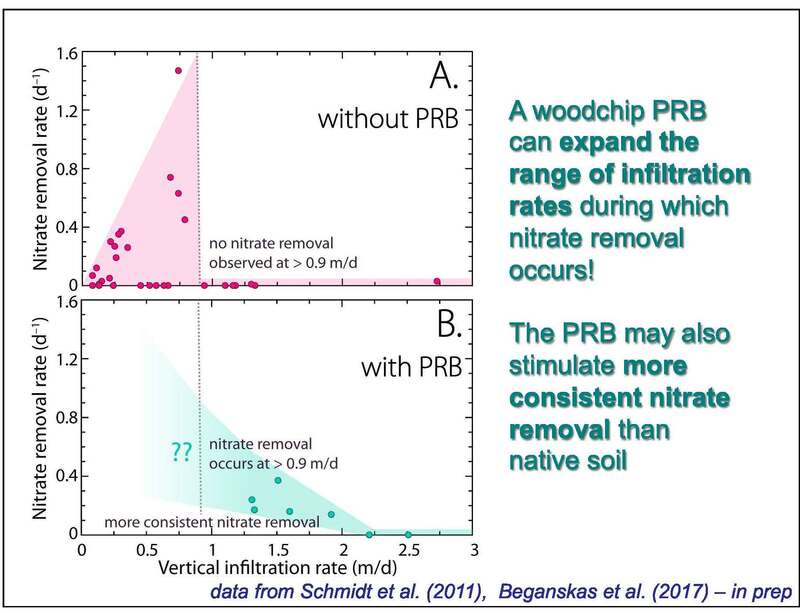 He noted that before infiltration, they all look very much the same; the top line shows the PRB after infiltration. Lastly, Dr. Fisher turned to incentives. Putting these systems in actually requires a commitment from a lot of different groups, including landowners and tenants, he acknowledged. 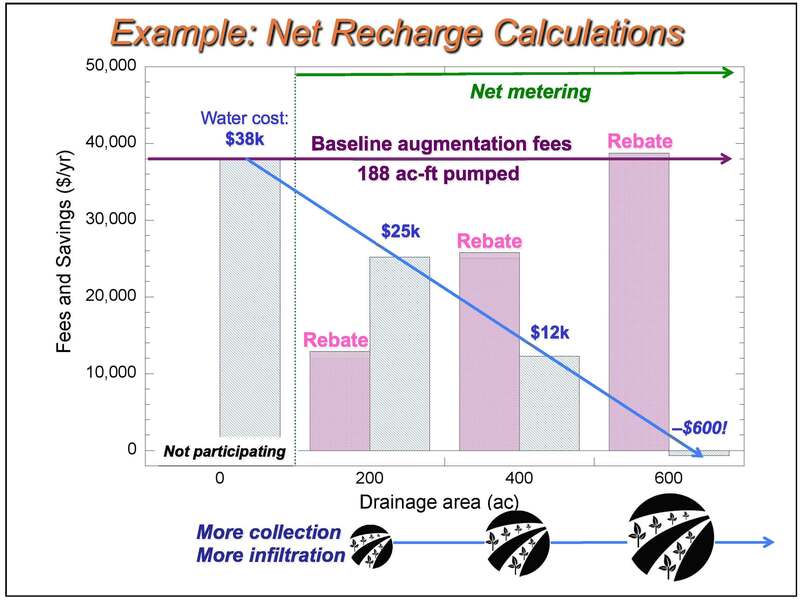 Such systems remove land from production and there are maintenance costs, such as the need to periodically scrape sediment out of the recharge basins. So how can people be encouraged to put systems like this in if they are going to be taking on a cost? 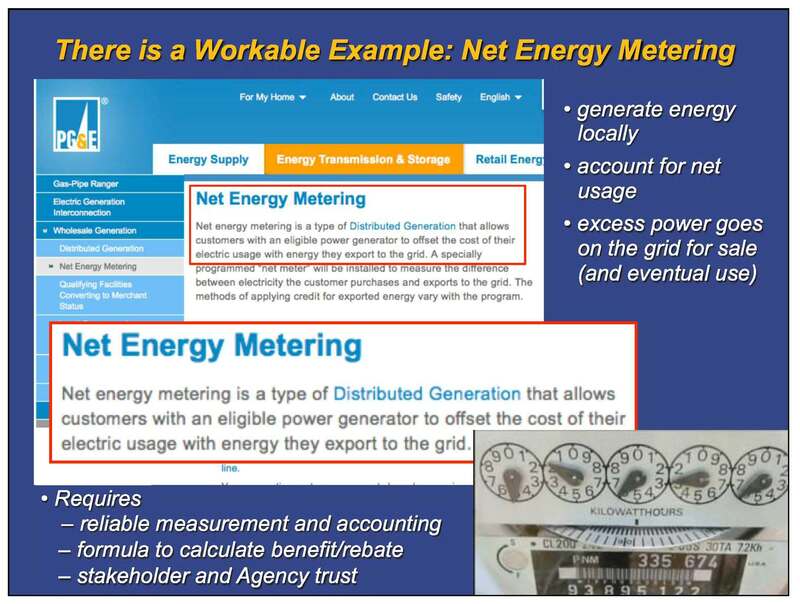 Dr. Fisher says there is a model called Net Energy Metering, which was developed and implemented by PG&E. Dr. Fisher explained that the concept is that if you have solar panels on your house and you generate electricity that is more than you need, you can put that power back onto the grid and your power meter would run backwards. It requires being able to measure and account for what you’re getting credit for, there needs to be a formula, and everybody has to trust each other, he said. It isn’t just a crazy idea, they are actually trying it in the Pajaro Valley as a pilot program with the goal of getting 1000 acre-feet per year into the ground through 8 to 10 field projects. Dr. Fisher’s group is the third party certifier; the Resource Conservation District of Santa Cruz County helped to identify the sites. They write grant proposals to raise the money to put these in the ground; they sit with the engineers and develop the plans so that they can measure how they work. “That’s really important because if we try to come in later after something’s already been built and measure the flows, often it’s impossible because the water is coming from everywhere,” he said. As of right now, one site has been operational in the past year; three more are supposed to go online before the start of the rain in fall of 2017. They have a cue of additional sites as people want to be a part of the program. “Right now, we’re just limited by our own capacity to actually evaluate sites, get them funded, raise the capital, and then actually get them put in,” he said. 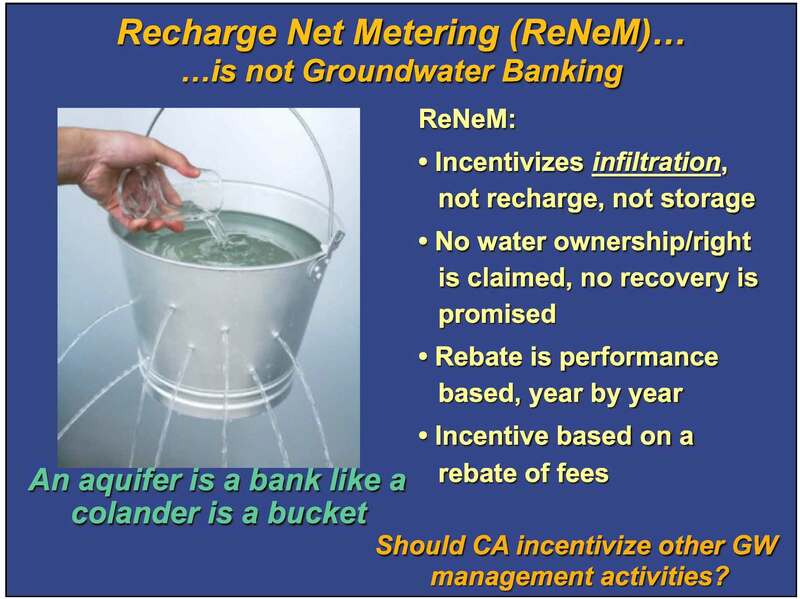 Since the incentive is a rebate of fees, the agency isn’t coming up with money to buy water; what they are doing is allocating part of the funding for their rebate program to support the recharge net metering program. Stormwater is a resource; it has historically been treated as a nuisance and as a liability, so shifting to thinking about it as a resource is really important, Dr. Fisher said. “It’s an ongoing work that we all have to do to get people on board with the idea of thinking about the benefits of retaining some of that stormwater a little bit longer on the landscape,” he said.